The amazing thing about today’s technology is that it can help us with all manner of things! From finding out information to keeping us warm at night, technology plays a big part in our lives. One way that technology is gaining popularity is with those that want to lose weight. Years ago, the only way that most people lost weight was to go down the gym and burn off those calories. But these days, technology can help us to manage the food we eat and even what exercise we need to do! In this handy guide, I will share with you some examples on how technology can help you to lose weight and maintain a trimmer figure. Here is what you need to know. Are you the proud owner of a smartphone like the Apple iPhone or Samsung Galaxy? If so, you will be aware that you can download a plethora of apps for your mobile device. But what you might not be aware of is that there are many health and fitness-related apps that you can use! RunKeeper is one of my favorite apps. 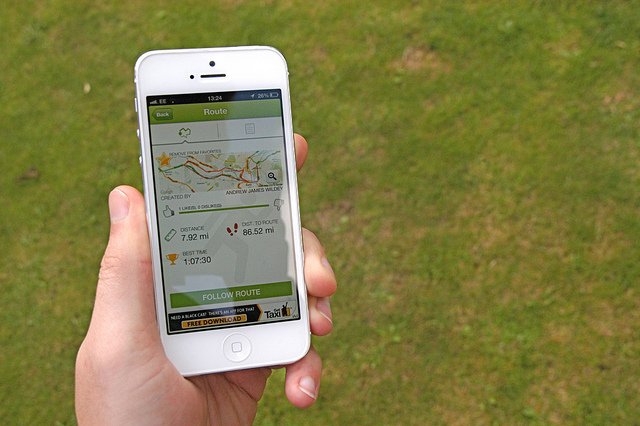 It’s a great way to help you track your progress when you walk, cycle or run. It plots your route on a map, tells you how long you’ve spent, and it can even tell you how many calories you’ve burnt! Another app that I like to use is MyFitnessPal. It helps you track the food and drink that you consume on a daily basis, and can even set a calorie goal that you can aim for on a daily basis. It has a database of food and drink, and it will even let you add new items that aren’t in the database. Just those two apps alone offer a great way to help and encourage you to lose weight. We all know that services like Facebook let us stay in touch with our friends and family. But it’s also a great way of sharing your fitness goals. One of my friends uses Facebook to organize weekly running groups with local people that are also keen to lose weight and keep fit. They use Facebook to encourage each other and share information on what weight they’ve lost each month. It’s a bit like Weight Watchers but for Facebook! As odd as it might sound, taking daily snaps of your healthy meals and posting them to Instagram will encourage you to stay healthy! Before I started my diet and healthy eating regime, I decided to go for a full health check. One of the doctors there told me that many of their other patients use Instagram as a way of logging their daily meals. It serves as a visual reminder of how losing weight can be a fun thing to do and not a chore. I hope these top tech tips will go some way to help you lose weight and keep the weight off you. Good luck!